Happy Holidays, all you Sprocket Podcast devotees! Or, as these socks suggest, happy Challah Days if that is appropriate to your observance. Brock went to Boston as is his custom for the Christmas season, and while there he spoke with Michael & Bianca of the Lowell Kinetic Sculpture Race, an amazing feat of engineering and teamwork that sees groups compete with homemade human-powered machines through obstacles such as a river and a mud pit. Listen to our interview conducted in the back office of a seasonal skating rink! 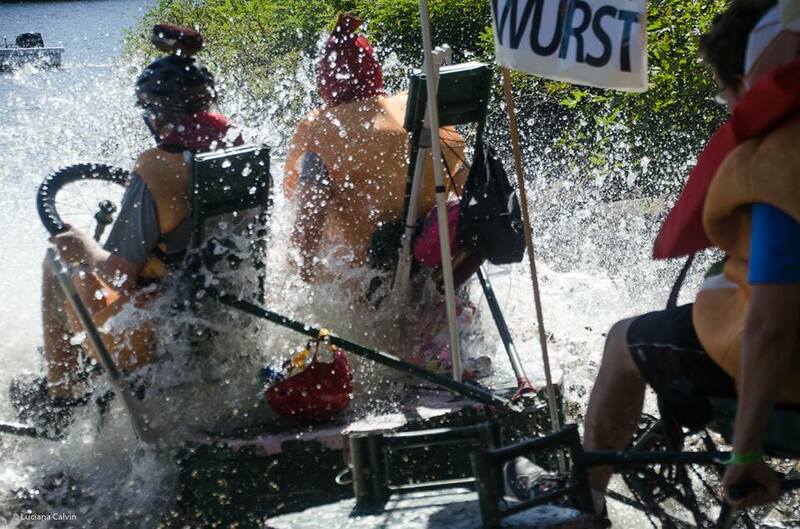 The Lowell Kinetic Sculpture Race happens every third Saturday in September EVERY YEAR, so get your team together and your machine engineered! Cour D’Alene, ID: https://www.gizmo-cda.org/, TBA 2018? See you back after the new year with another studio episode. Happy New Year to you & yours!